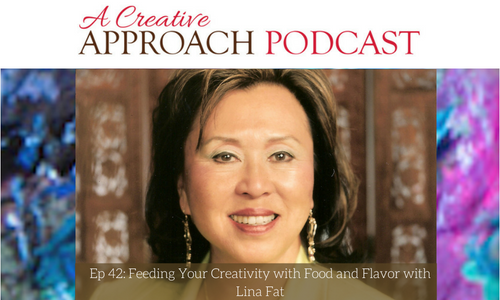 Lina Fat is VP of Culinary Research and Development for Fat Family Restaurant Group, based in Sacramento, CA. Her first dream was to be a pharmacist, which she fulfilled when she earned a Doctor of Pharmacy degree from the University of California-San Francisco in 1964, where she met and married her husband, Kenneth. Her father-in-law, the late Frank Fat, founded the landmark Sacramento restaurant, Frank Fat’s in 1939, where many of the state’s most influential figures have dined for more than 70 years. Lina joined the restaurant business when the second restaurant, China Camp, opened in 1974. In 1976, Fat City Bar & Grill was opened, and since 2000, the Fat family has opened Fat’s Asia Bistro in Roseville and in Folsom. Lina traveled the world to train under master chefs in Switzerland, France, and Italy, and at the Cordon Bleu in San Francisco and the Culinary Institute of America in New York. She has spent a lifetime discovering new culinary secrets for what is now her specialty—combining flavors from around the globe! She is a favorite featured guest on local Sacramento TV as well as authoring The Lina Fat Cookbook: Recipes from the Fat Family Restaurants. Lina and the Fat restaurants have received numerous awards over the years, and she has been actively involved in many community boards and organizations. Proving that her creative interests extend far beyond the kitchen, in 2007 she launched the Sacramento World Music and Dance Festival, which showcases the cultural diversity of the region through presentation of ethnic dance from around the world by local talent. Lina is a true pioneer who has never been afraid to take on one more challenge in her creative and inspiring life. Lina’s advice to those who want to be chefs—Develop your palate! It is always a joy to see creativity bloom where you least expect it. 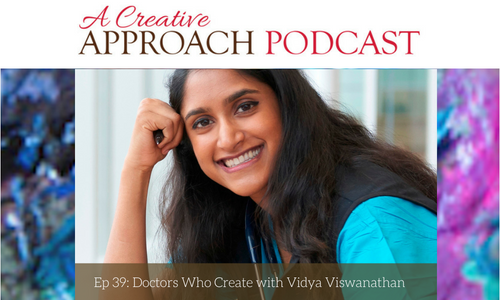 I am speaking with student physician Vidya Viswanathan today, the founder of Doctors Who Create. Vidya and her team are on a mission to change the culture of medicine by fostering creativity. It is such a delight to see colleagues in medicine with an interest in creativity. Vidya had the chance not just to explore how creativity plays an important role in medicine but also how her experiences of travel and foreign language have shaped her career as well. There is so much beauty in hearing a story shared well, and that is what is in store for you with Vidya today! Her perspectives are very unlike any we have had on the show so far, but her stories still have a little something for everyone. 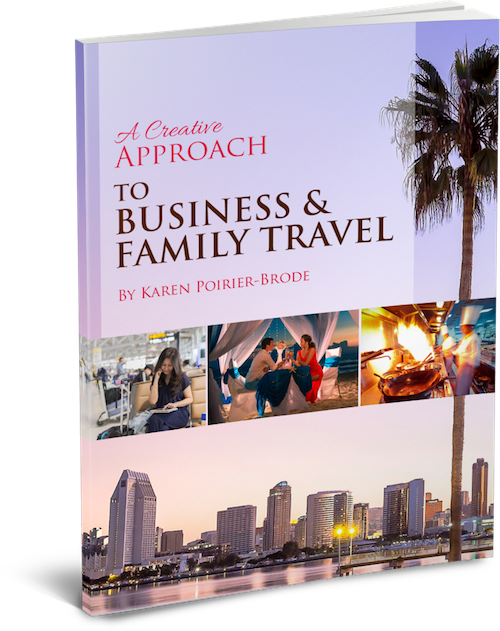 I am excited for you to join us as we explore Vidya’s journey to creativity and culture. Vidya shares her roundabout path to medicine and her biggest cultural influences. Medicine needs the influence of creativity too! Vidya wants to highlight the profiles of medical professionals who use creativity. Vidya shares what gave her blog some focus. The broader appeal of Doctors Who Create. Vidya’s parents encouraged her to read and write and express herself through words. Taking Chinese played an important role in Vidya’s creativity. Dive into some of Vidya’s best experiences while traveling in China. Do you know that May 5th is International (aka National) Scrapbook Day? By now, my regular listeners all know that I’m a really enthusiastic scrapbooker, and at the moment, I am busy creating a kit to take with me to Dixon, California, to celebrate this special tribute to scrapbooking. Although I have done more digital pages lately, I still love to take out my supplies and get lost in the world of cutting and gluing. In fact, I love getting lost in the whole dimension of paper storytelling! May 5th is a day to celebrate other things, too. It’s Kentucky Derby Day, Cinco de Mayo, Burgundy Day (the color-not the wine), Comic Book Day, Hoagie Day, and even National Seeing Monarch Butterfly Day, to only mention a few! Most importantly, may 5th is Silence the Shame Day. Mental illness is far too common, and it’s very treatable! So let’s all speak out, advocate for more resources, and encourage those in need of help to seek it. What did you celebrate May 5th? I’d love to know! I’d also really love to know if you found a creative outlet for telling your story. I’m really looking forward to today’s show with my noteworthy guest, Nancy Nally. Nancy is both a columnist and a journalist. Alliteration in her name could be one reason why Nancy Nally is known, but she is also known for her nose for news. On today’s show, we discover the latest trends in colors, papers, and motifs, from here and abroad. 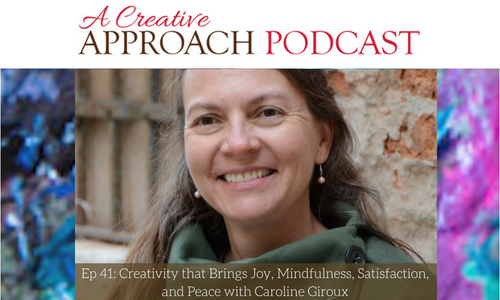 We also learn about the job of a craft journalist, and about how Nancy found her creative approach. 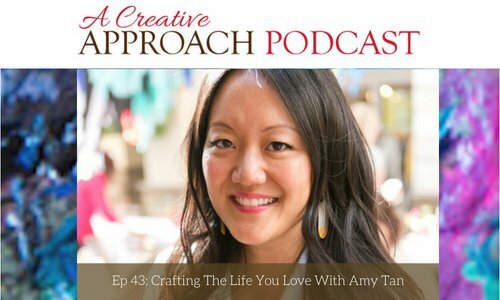 I first met Nancy through the craft world, and more specifically, via events of the AFCI (Association for Creative Industries), formerly known as The Craft and Hobby Association. Nancy is no stranger to podcasting and helped host The Paper-Clipping Roundtable, while it was an active broadcast. 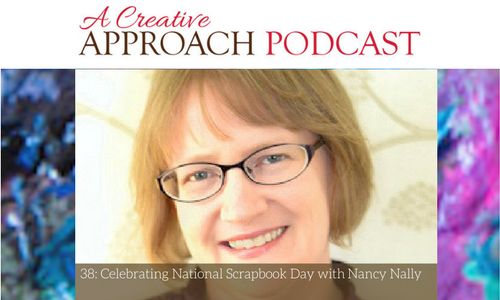 Join me today, and listen as we take a peek at Nancy’s creative approach, and as we also celebrate creative crafts! Nancy discusses her career and blog. The three craft industry-related websites that Nancy’s company owns-Scrapbook Update, Craft Critique, and the recently launched Chasing Dust Bunnies. The kinds of crafts on which Nancy focuses. Some of the really hot crafts, along with craft comebacks. The way that trends filter down into the crafts industry. The ways trends here differ from European trends. The latest trends in colors. Chalk paints are currently a big craze in Europe. The DIY trend is going strong in Europe, and there is much to facilitate this! Metallic finishes are very popular. How do rubber and wood-mounted stamps fit into your scrapbooking strategy? What creativity means to Nancy. 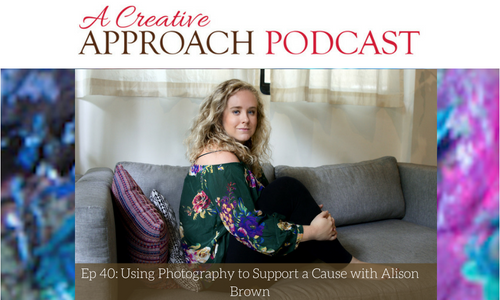 Please join our Creative Approach Facebook Page, and the Creative Approach Facebook Group, too!